Our Research and Evidence Team hosts monthly lunchtime seminars. Find out more information below on our upcoming seminars as well as details and presentations from past seminars. If you would like to find out more about any of the seminars or request presentations please get in touch with us at bnssg.research@nhs.net. In this seminar Dr Nikki Cotterill will present her recent work exploring how to improve continence care services across Bristol, North Somerset and South Gloucestershire through creative stakeholder engagement. Nikki will discuss her approach to identifying the key stakeholders, conducting preliminary interviews and holding a co-production engagement event to bring all these perspectives together. This work was made possible through National Institute for Health Research Capability Funding, which the Bristol, North Somerset and South Gloucestershire CCG Research and Evidence Team awarded to Nikki in 2018. Logic models are valuable visual tools for designing, evaluating and implementing health and wellbeing interventions best suited to their local context. This interactive seminar offers a brief guide to using and developing logic models, with opportunities for informal groupwork and discussion, plus examples of their use within the NHS. The Weston Intensive Support Scheme (ISS) is a six-month project to support GP recruitment and retention. The project requires all Weston and Worle practices to work together, designing a new process to reduce workload and improve patient care. In this seminar, Denys Rayner talked through the challenges the Weston ISS Team have faced as well as emerging findings and key lessons from the project, providing a unique insight into the new primary care networks. Promoting the traditional Mediterranean diet for cardiovascular risk reduction in the UK: challenges and opportunities. In this seminar, Dr Angeliki Papadaki from the University of Bristol presented current research on the Mediterranean diet as a health intervention, shared lessons learned on barriers to adoption, and talked about how these findings could inform interventions to promote the diet in the UK. Research on the organisation and delivery of urgent care services. Paramedics identifying people at the end of life. 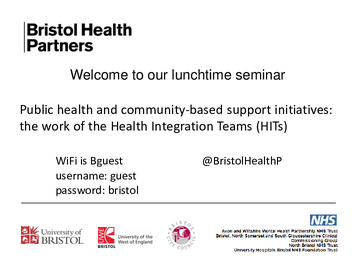 In January 2019 we hosted a seminar alongside Bristol Health Partners on Public health and community-based support initiatives: the work of Health Integration Teams (HITs). Bristol Health Partners Health Integration Teams (HITs) address pressing health challenges to improve health outcomes across BNSSG. HITs bring together health and care professionals, patients, members of the public, commissioners, local government, third sector organisations and researchers. 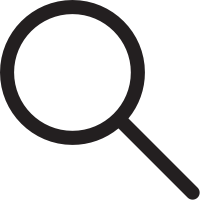 A compilation of the presentations given at the research and evidence lunchtime seminar in January 2019.